One of the advantage of paper clay is that it allows you to fire directly from greenware to your desired Cone. So far, I’ve only test fired small pieces of a porcelain paper clay from bone dry greenware to Cone 5. They came out with no problems. I had a chance to make a larger piece and this was the result. This piece, titled, “Fragment” was a one time fire. The clay is Gault 10 paper clay from Aardvark. No glazes were used. I used a black slip on the base and red iron oxide for the shell fragment. I left the tentacles the raw Gault 10 paper clay. 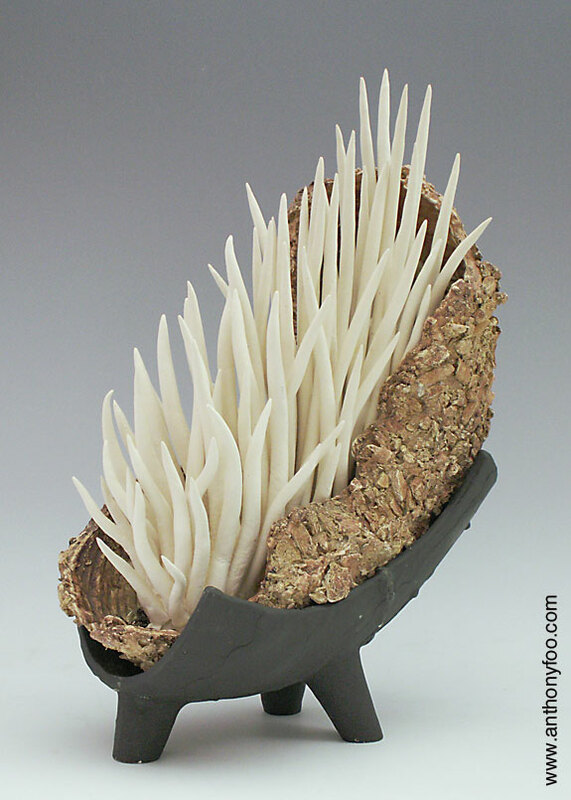 This piece was fired from bone dry greenware to Cone 5, bypassing the bisque stage. Obviously, if your piece allows you to do this kind of one fire, you save on time and on the gas/electric bill. I was introduced to this word in my art class in college. The instructor explained that sometimes your art needs time to be fully realized. 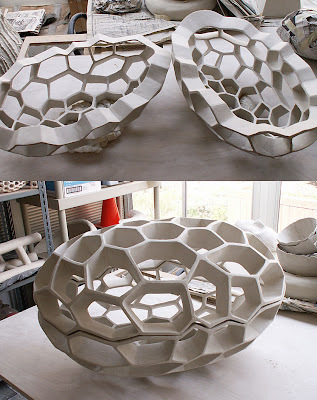 It takes time from initial concept/idea to something tangible. This is the gestation time for your art. Over the years, I’ve come to appreciate the meaning of that word. At times, ideas and the creation of the art come rather closely together. Other times, it takes a while for me to be satisfied with the end result. When I find myself stuck or at a loss for ideas, it’s time for me to take some time off from that piece, leave it aside for a while and then come back to it later. Case in point was this new piece, titled “Symbiogenesis.” After making the wire mesh pod I was stumped as to how to finish it. I sprayed a sealant over it, which intensified the color of the fired clay which I did not care for. I preferred the brighter white of the clay so I had the piece refired. I tried some kind of attachments to the end of the pod to suggest tails or flagella, but that did not sit well with me. I toyed with the idea of a vertically mounted piece but that opened up an entirely new can of worms involved with installation and pedestals, etc. I knew I wanted something inside the cavity of the pod; that’s the entire theme of the title. I played with several ideas unsatisfactorily and finally decided to keep the image simple and clean. This piece was over a year in the making. 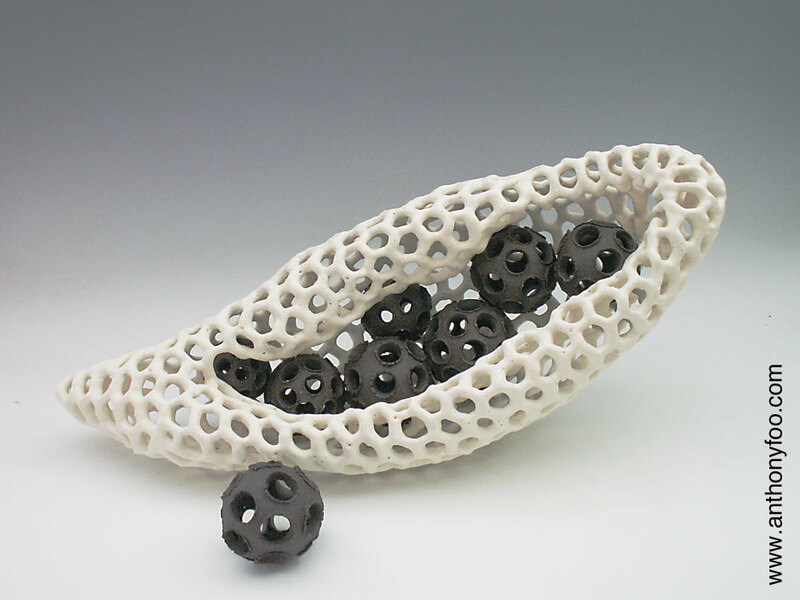 The piece is 27"L x 11"D x 9"H. The outer pod is paper clay over steel mesh, fired to Cone 06. The internal spheres are homemade Black Mountain paper clay, Cone 10 reduction. No glazes were used. Water is essential in ceramics. Indeed, clay is weathered down rock by water erosion and deposited over million of years. When we are in a ceramics studio, we do all our washing and cleaning up at the sink without giving too much thought to that valuable resource – water. And we use a lot of it. In my studio, I don’t have a sink so I do my washings in 5 gal buckets. I reuse these plastic containers and ask my friends to donate if they have them. I’ve even been known to dumpster dive when I see a container or two that has been thrown out. 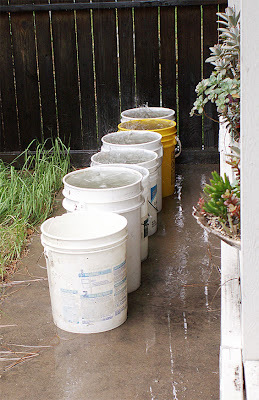 Rain comes only infrequently in Southern California but when it does I put out my buckets to collect the run off from my patio. I use the water to clean my studio, my hands, clay tools, etc. Extra water is used to water the plants and yard. When you don’t have a sink, it makes you conserve the amount of water you use and forces me to reuse the water until it becomes too muddy for clean up. When that happens, I set the clay water in the bucket aside. The heavier clay will settle to the bottom and the clearer top water is used to water the grass. The heavier sludge at the bottom is left out in the sun to dry out. It takes several weeks for this to happen. 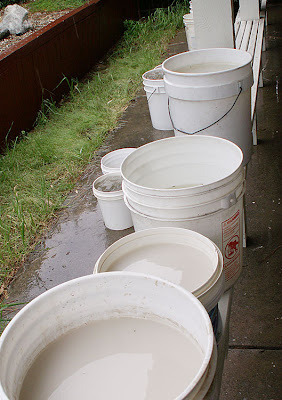 The dried out “cake of clay” at the bottom of the bucket will pop off rather easily and can be disposed of in the trash. This way, you keep the clay out of the sewers and your drain pipes. The top picture shows the rain run off collecting in the 5 gal. buckets during the rains we had yesterday. The bottom picture shows my wash buckets. I will be teaching a paper clay workshop for the students at the McGroarty Arts Center on Sunday, April 29, 2012. My first workshop there was in 2009 and it was very well received. This one day workshop will cover the basics of paper clay for the beginners and some advanced techniques for the more experienced. 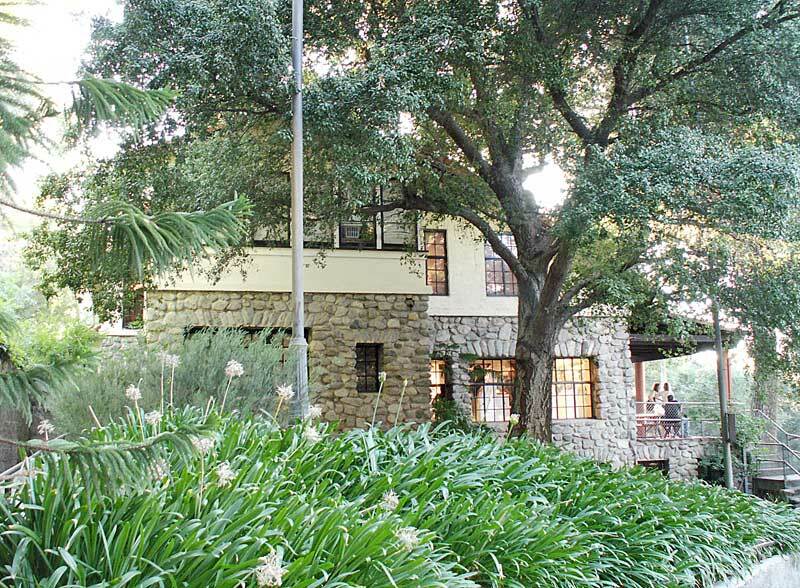 The McGroarty Arts Center is located in the north Los Angeles area. It's up on a little hill amid natural stands of oak trees; an oasis for ceramic arts in this area. This idyllic and serene place is a nice respite from the hustle of the city. A great place for inspiration. 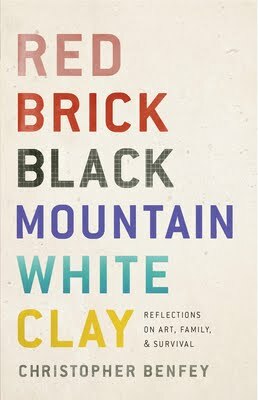 Recently I was contacted by TLC Book tours to be part of their book tour for this new book, "Red Brick, Black Mountain, White Clay" and asked if I was interested in doing a review. I gladly welcomed the opportunity, especially from my ceramics background, to read and learn more about early American arts. Written by Christopher Benfey, it is part-memoir of his family's involvement in early American art and part-history of Black Mountain College and its contribution to early pottery in the US. I enjoyed reading the intertwined histories of the individuals, their lives, events and places. The three sections of the book (Red Brick, Black Mountain, White Clay). Red Brick talks about the red clay world in North Carolina where his mother grew up. The Black Mountain section is about the early days of Black Mountain College and its contribution to American art. The last section, White Clay, and for me, the most interesting and riveting part, chronicles the search for the special, wonderful, snow-white clay. Today, we buy our clay already bagged from our favorite ceramic supply store. The book details the search for this elusive "beautiful white clay" was so highly priced for making porcelain that men risked their lives looking for it. Reading about how they dug clay up from the ground, the challenge of finding good quality clay makes me appreciate the wonderful resource that we have. I actually longed for digging up my own clay, if only once, to feel what it would have been like. There are still potters in the US who have the privilege of connecting with Mother Earth. The book has a lot of family history with many life stories coming and going. The writing on the whole is easy to read. I welcomed the pictures included in the book. It made is more personal and intimate. As a ceramic artist, I enjoyed the reading about experiences with the material and the struggle and evolution of ceramics in early America. In all, the rich family history of the author is something worth preserving. The top picture shows the two halves removed from the pod mold. The bottom picture is the two halves fitted together. Bone dry shaping proved to be another time consuming task. I decided to finish the "cells" more in the green stage rather than wait after the bisque. Sanding and rasping with a metal rasp was the fastest and most efficient way to take down uneven surfaces. The green bone dry paper clay was strong enough to stand up to my sanding. Score another one for paper clay! The paper clay is Gault 10 from Aardvark Clay in Santa Ana, California. It can be fired up to Cone 10. Will post the picture of the piece after firing. CAUTION: When sanding bone dry clay projects, always wear a face mask and sponge down your work area frequently to keep down the dust. Or another title is "Boy, am I glad I'm working in paper clay!" 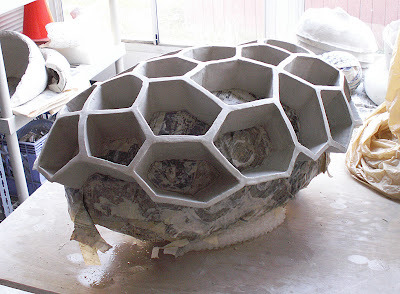 My current project has me making honey comb cells around a pod shaped interior. As the work progressed, I remarked to myself how naturally and efficiently the honey bees make this structure. By contrast, I struggled with keeping the hexagonal 6-sided forms; sometimes I had to make 5-sided instead. Of course, bees have been doing this for eons and this was my 2nd week on this project. I had some trouble separating the two halves from the pod form, mainly because I did not use enough scrap paper as cushioning material. In the end, I had to sacrifice my paper clay pod mold to extricate my two halves. In the process, several of the sides broke and this was one of many instances I was so glad I was working in paper clay. Repairing the breaks was routine using dry on dry joining techniques. Eventually, everything was put back together and the two halves checked for fit. Other adjustments had to be made using the same dry on dry joining. No other clay affords me this peace of mind and flexibility. When I go to galleries and see a work titled as "Untitled 1", etc. I often wondered what goes through the mind of the artist? Surely the artist must have some kind of idea what the piece he/she is producing. For me, the title of my work drives the entire process; from initial concept to sketches and the actual piece. For me, the title is an important and integral part of how I work. The story of the piece lies in the title. It is kind of like a hidden code or message from the artist to the viewer. If you can "crack" the message of the title, you have delved into a deeper part of the piece and to me, you have made a connection with the artist.